Carbon fibre, the final frontier in case modding. You have probably heard people asking about using carbon fibre for cases on forums all over the web just to see the common reply that it isn't possible to do without a lot of specialist tools. Well that is partially true, to make a case using the same process that is used in a formula 1 car would be very difficult and expensive. 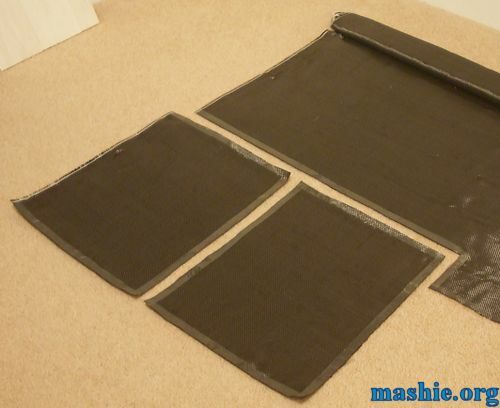 There are two approaches for making panels with carbon fibre, the one above using carbon fibre fabric with pre impregnated resin that needs vacuum and heat to cure for best possible performance. 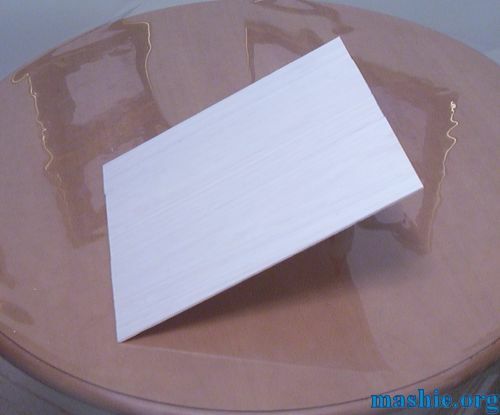 This makes it suitable for extreme conditions but also very expensive and complicated to manufacture. The approach used here won't give the same extreme strength/weight ratio but will make it easy enough to do home at the kitchen table. The process is known as wet layup, carbon fibre fabric is mixed in layers with epoxy resin and cured in normal room temperature. Carbon fibre, like fibreglass, can cause serious respirtory problems if you inhale shards. Always wear a face mask when handling the raw cloth or cutting a finished panel. And take the warnings on the epoxy and hardener bottles seriously. These chemicals can, have and will cause brain damage if you don't take precautions. This is all the material needed for a nice strong carbon fibre panel. At the top we have the epoxy resin from West System, the resin is number 105 and the hardener is 205. 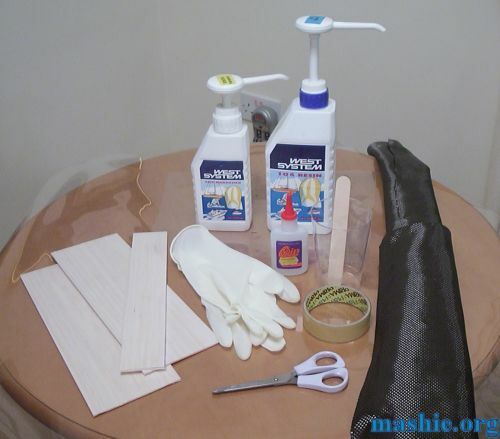 From the left we have 3mm (1/8") balsa wood panels, disposable latex gloves, cyanoacrylate glue, disposable plastic cup, tape, wooden medispat and finally the 200g per square meter carbon fibre fabric. Underneath it all is a sheet of polyester film. First step is just to glue the balsa panels together with the cyanoacrylate glue. Next step is to measure the pieces needed from the roll of fabric. 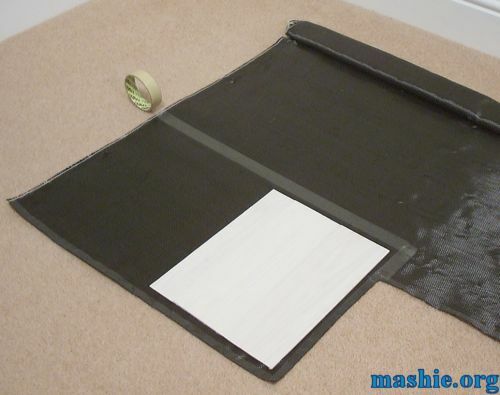 To minimize the waste of carbon fibre it is a good idea to apply tape where you intend to cut to get a clean stable edge. A normal scissor will easily cut the fabric to shape.